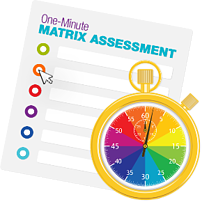 Take Your Free One-Minute Matrix Assessment! At MMI, we help organizations EVOLVE. We transform their operations, so they can achieve true organizational effectiveness. The evolution process starts by gathering insight into potential causes of common operational challenges that could be limiting the organization’s ability to execute its strategy. In this survey, we are going to ask you about some challenges you may have, and in the report that follows, we’ll provide feedback on some potential root causes of those challenges.